By his own admission, there have been times when Stuart Armstrong has appeared out of place as a Celtic player. It is just over a year since he made his £2 million move from Dundee United, a period in which he says he has found it difficult to handle the greater physical and mental demands placed upon him at the Scottish champions. Having hit the ground running with a goal on his debut against Partick Thistle 12 months ago, quickly followed up by another strike and an outstanding individual performance in the 3-3 Europa League draw against Inter Milan, Armstrong has since found momentum and consistency elusive. “There are times when I haven’t coped as well physically or mentally,” he said. “But it’s about learning and this is my first proper full season with Celtic. I’m learning more every day about how to accept being a Celtic footballer and everything that comes with that. “My body has had to deal with the greater volume of games you play here. There are mental demands as well. This is a huge club and there is loads of pressure and if performances aren’t up to scratch, everyone knows about it. So there is no denying the huge mental aspect of being at Celtic. But the combination of that and the physical aspect can be challenging. “That’s the difference between here and Dundee United. If you have a bad performance for United, the amount of people who would see it or talk about it would be miniscule in comparison to Celtic, but that’s life and something you have to get used to. “I’ve always had high expectations of myself and if I haven’t performed as I would have liked to, I think quite negatively afterwards. But you cannot be that way because football isn’t perfect and every game isn’t perfect. So you need to take the positive aspects from each game and forget the other parts. The 23-year-old has not been helped by his deployment on the left of the attacking midfield trio in manager Ronny Deila’s preferred 4-2-3-1 formation, rather than a more central role where he believes he would be more effective. “That’s been challenging now and again,” he added. “Naturally, I am a central midfielder, but we have a lot of competition in there. “I’m just happy to be part of the team and if that is on the left, then it is on the left. In an ideal world, of course I’d love to play centre midfield. The intense competition in midfield is set to be increased with the promotion to the first-team squad this weekend of Patrick Roberts, recently signed on an 18-month loan from Manchester City. 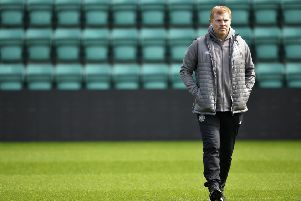 Neil Lennon gives injury update on key Celtic player - could his season be over? Celtic assistant manager John Collins confirmed there is “a good chance” of the 19-year-old winger being involved in today’s Premiership fixture at home to Inverness, following two stand-out displays for the under-20 side. But Collins has warned against reading too much into the £12m fee City paid Fulham for the England youth international last summer. “When you talk about those figures, sometimes people in Scotland see it as a massive fee and expect him to be ready for our first team right away,” he said. “But we have to be realistic. It’s a strange market financially in England. He only played 20 substitute games for Fulham. Normally in days gone by for £12m you’d have played three years at the top, have 30 international caps and 20 goals, but the world has changed down there. But he’s got talent and that’s why City paid so much money for him. “Patrick is much closer to being involved with the first team this week than he was last week. He wasn’t up to speed when he first joined us. He’d been injured a few weeks earlier. He hadn’t played many games.